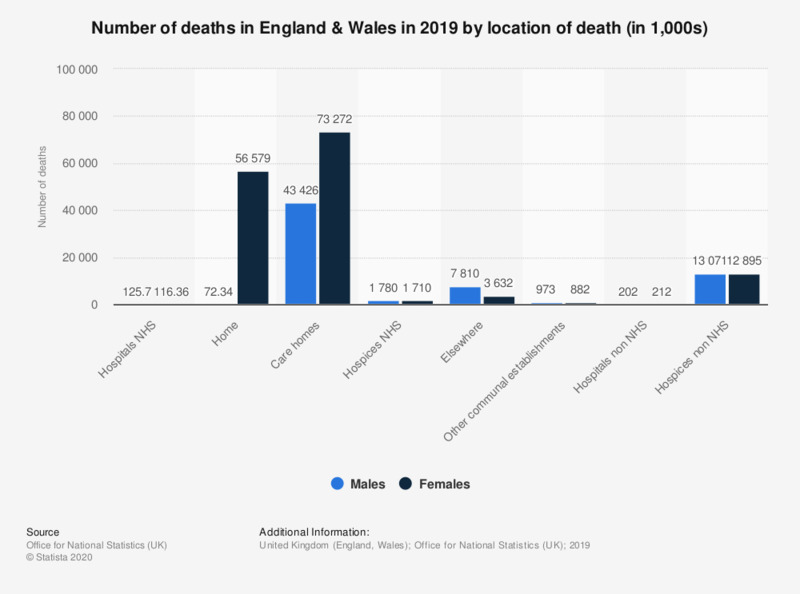 This statistic shows the number of deaths in England & Wales in 2017, by location of death. Almost a quarter of a million deaths took place in hospitals in 2017, the most of any location. This was followed by deaths which occurred at home at approximately 125 thousand. * Information from the source: Place of death is defined using a revised place of death classification. Deaths at home are those at the usual residence of the deceased (according to the informant‚ where this is not a communal establishment. Care homes includes homes for the chronic sick; nursing homes; homes for people with mental health problems and non-NHS multi function sites. Hospices include Sue Ryder Homes; Marie Curie Centres; oncology centers; voluntary hospice units; and palliative care centers. Other Communal Establishments include schools for people with learning disabilities; holiday homes and hotels; common lodging houses; aged persons’ accommodation; assessment centers; schools; convents and monasteries; nurses’ homes; university and college halls of residence; young offender institutions; secure training centers; detention centers; prisons and remand homes. Elsewhere includes all places not covered above such as deaths on a motorway; at the beach; climbing a mountain; walking down the street; at the cinema; at a football match; while out shopping; or in someone else's home. This category also includes people who are pronounced dead on arrival at hospital.